Logic programming is a programming paradigm based on formal logic. A program written in a logic programming language is a set of sentences in logical form, expressing facts and rules about some problem domain. Major logic programming language families include Prolog, Answer set programming (ASP) and Datalog. Logical foundations. 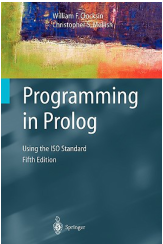 Introduction to Prolog programming. Questions, variables, conjunctions, rules, goals. Prolog syntax. Characters, operators, equality and matching, arithmetic. Using data structures. Programming techniques on Prolog (Mapping, recursion, accumulators, difference structures). Backtracking, generating multiple solutions, the cut. Unification, computational model of logic programs.